The spiritual successor of the original Samsung Galaxy Tab has arrived and has debuted at CES as a Verizon exclusive. This is lighter and thinner then the original and is bolstered with an updated version of Google Android. The new Samsung Galaxy Tab 7.7 is a very pocket friendly device featuring a super AMOLED PLUS display with a resolution of 1280×800 pixels. The screen looks very slick and Samsung told us officially that they experienced some trepidation creating such as large display using the technology often found in their line of smartphones. Underneath the hood is a sweet 1.4 GHZ dual core processor with 1 GB of RAM and 16 GB of internal storage. Of course if 16 GB is not enough you can expand it via the MicroSD for an additional 32 GB. If video chatting and taking pictures matters to you, there is a front facing 2 MP camera and a rear facing 3 MP version with LED flash. Not only is the Galaxy Tab 7.7 being billed as a tablet for multimedia use but also as a universal remote control. Along the side of the unit is a IR port that is half an inch. This will allow it to interact with your television, Bluray and other home electronics. This unit is thinner and lighter then the original and comfortably fits into your back pocket. 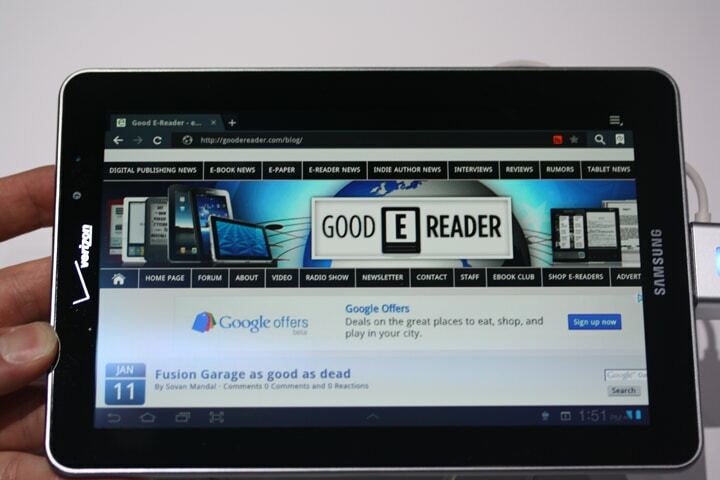 Often with 7 inch tablets such as the Kindle Fire and Nook Tablet for reading, being light matters a ton. This unit feels on par or lighter then both of those models and could really be your primarily device to read books, magazines, newspapers and other content. Speaking of reading the unit is bundled with the Readers HUB, which gives you access to Zinio and Kobo. This is an exclusive suite that is heavily customized for the entire line of Samsung Tablets and Smartphones. The interface and reading apps look vibrant on the screen and magazines looked amazing. Of course, since this unit runs Google Android 3.2 you have access to the official Google Android Market. This gives you vibrant choice of indie or mainstream e-reader applications. You can find Kindle, Nook and Sony to buy and read books or go with Aldiko and Droid Comic viewer to load in your own. Aside from reading there is a number of preloaded apps and games that come with the device that are fairly standard. The Samsung Galaxy Tab 7.7 also sports the Touchwiz interface which makes things easier to deal with on a touchscreen level and makes the entire Android experience a bit more unique. So what is the deal with 4G and LTE on Verizon? It is super fast! We had our Good e-Reader Blog load in under 6 seconds and as you know, we are very graphic heavy. The speed in which content loads and streaming videos plays made be fairly happy and is a step in the right direction. What if you don’t do business with Verizon or live in other countries like Canada? Samsung told us that a pure WIFI model is planned in the next few months. Normally with exclusives such as this particular model a company out of the gates will get the model and market it solely by itself. After a certain time-frame Samsung will then be able to market it to other providers or telecommunication companies to offer it to their customers. In the end, this is a great tablet and one of the best ones at CES that have yet to be released. The screen is vibrant and the brushed aluminum back makes it look like a high end device and appeals to many people on an aesthetic level. It also has HDMI and all of the expansion ports you need to integrate this into your daily life. this was honestly one of my favorite devices of the day ! Super thin, 4G LTE, the list goes on , whats not to like! ?